Some Nigerian military officers have been lined up for sack by the headship of the three Armed Forces and other senior officers, a new report has revealed. Plans are being made to retire promising officers in the Nigerian Army, Nigerian Navy and the Nigerian Air Force, SaharaReporters has learned. The officers being lined up for the sack are those in line to rise to the headship of the three Armed Forces and other senior positions, but whose promotions have been impeded by the retention of senior officers who have already overshot the mandatory 35 years of service, are above the prescribed age for continued stay in service, or both. This website recently published a story, “How Service Chiefs Illegally Extend Careers Of Course Mates,” which exposed a number of senior officers long overdue for retirement, but who are still in service because of their closeness to service chiefs or are strongly wired to sources of power in the Presidency. 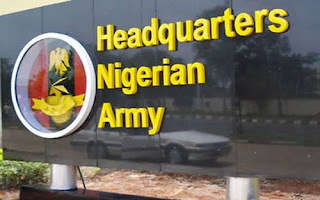 Responding to the story, Major-General John Enenche, Director of Defence Information (DDI), admitted that some officers had been kept in service despite having spent more than the stipulated 35 years or older than 56 years stipulated in the Armed Forces Harmonized Terms and Conditions of Service (HTACOS) for commissioned officers. In a statement issued on 13 June, the DDI said Paragraph 02:10 (d) of the HTACOS allows for extension of service beyond the stipulated number of years. “In very exceptional cases, an officer’s career can be extended beyond one year for as long as necessary. Extension of service for officers can only be approved by the Service Council/Board, comprising the Honourable Minister of Defence, Chief of Defence Staff, the Service Chief, Service Director at Ministry of Defence and Permanent Secretary, Ministry of Defence. Extension of service can also be at the discretion of the Commander-in-Chief,” said the DDI. Policy guidelines on the matter, he claimed, have always been followed. The DDI, however, claimed inaccurately, that only a few of the officers listed in the story as having overshot the prescribe age limit and years of service are still in the Armed Forces. SaharaReporters’ investigations showed that what led to the reduction in the number was the move by the Navy to quickly disengage all its officers named in the story. The cull, SaharaReporters was reliably told, will be followed by another one affecting brilliant young officers considered as threats to the positions of the service chiefs and their candidates occupying positions into which younger and money competent officers should, by right, move into. As a result, panic has gripped the ranks of young officers, who seem set to be thrown out the Armed Forces for nothing other than being competent and to make candidates of the service chiefs breathe more easily in positions they inappropriately occupy. The service chiefs, SaharaReporters was also told, have been propping up their less qualified candidates to replace the generals that should have retired. This, we gathered, is being worked on in case the plan to retire more competent officers does not come to fruition. Major-General Enenche’s claim that only a few beneficiaries of service career extension mentioned in the story remain is unlikely to stand any scrutiny. SaharaReporters’ investigation showed that Major General JG Hamakim, a pharmacist, remains the Director-General of Nigerian Army Resource Centre. He has already overshot the age ceiling of 56 years, when Major-Generals must retire and clocked 35 years in service on 24 June. He is also widely considered of as not very conversant with field concepts, combat doctrinal maneuvers and applications. Also in the same category is Major General AO Amusu, incumbent Commander, Nigerian Army Medical Corps. He equally clocked 35 years in service on 24 June and is deemed to be impeding the elevation of qualified officers, many of whom are consultant surgeons and with field experience in ECOMOG and other military operations. In the Air Force is Air Vice-Marshal J Gbum, current Chief of Policy and Plans at Air Force Headquarters. He is above 56 years, having been born on 15 May 1960, and has spent more than 35 years in service. He was commissioned on 12 September 1981. Similarly mentioned in the report published by SaharaReporters was Air Vice Marshal AA Iya, Chief of Training and Operations at Air Force Headquarters. He had started his terminal leave in September 2015 and was scheduled for final disengagement on 25 December 2015, when his course mate, Air Marshal Sadique Abubabkar, the Chief of Air Staff, recalled him and gave him a one-year extension. Born 25 December 1959, he is above the age limit of 56 years and was commissioned on 15 May 1982. ARE YOU SEEKING FOR A RICH SUGAR MUMMY/DADDY/LESBIANS/GAY/ IN NIGERIA, GHANA, ANYONE INTERESTED SHOULD CONTACT AFRICAN DATING AGENCY ORGANIZATION DATABASE ADMINISTRATOR IN NIGERIA VIA(+23408145236851)the only true legitimate agency for people who are seeking for rich and wealthy sugar mummy/daddy/lesbian/gay/ in Nigeria/Ghana u can also have the opportunity to attend our sugar mummies parties and the executive ladies and men parties by contacting Africa dating agency. we have links with ladies who are EXECUTIVES, BUSINESS DIRECTORS, ENTREPRENEURS, BIG TIME OIL LADIES, BANKERS, GOLD DEALERS, LADIES WHO OWNS THEIR OWN COMPANIES, OIL RIGS, AND we also have them in FOREIGN COUNTRIES, LIKE DUBAI LONDON, PARIS, UNITED STATES OF AMERICA, we are around the world…. WE DELIVER UNIQUE, RELIABLE, CONFIDENTIAL SERVICE TO ALL OUR CLIENT But you must be very presentable, handsome, pretty and humble, you must also be very good on bed.